Still maintaining a patriotic interest in the cause of the North he again enlisted and September 16th, 1861, was commissioned a second lieutenant in Company F of the 36th Indiana Volunteers. 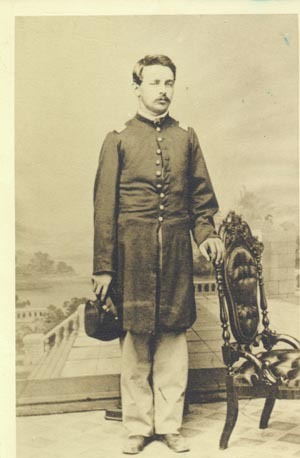 On March 1st, 1862, he was promoted to the rank of first lieutenant in the same company. This company was present and took part in the battle of Shiloh in April, 1862. At that time Lieutenant Harris was not of rugged physique and he was taken sick as a result of the Shiloh campaign, as many soldiers were, and he was sent home. Still sick, he resigned from the service June 9th, 1862. He had the distinction of taking part in the closing battle of the war, that of the attack on Blakely Fort in Alabama. At the opening of that engagement the regiment then of five companies was in command of Lieutenant Colonel Oran Parry, but early in the battle he was wounded, and taken off the battle field. Captain Harris thought his Colonel had been killed, and removed his papers from his person, and then took command of the regiment. During the remained of the engagement, and until surrender of the Fort he was in charge of the regiment. For his previous service and action in this battle he was breveted a colonel, but the war closing he was never commissioned as such. Captain Harris goes to his final rest, remembered as a brave and faithful soldier, a kind husband and father, an upright citizen, and a gentleman who loved his friends and was loved by them. This entry was posted in 36th Indiana Infantry, 69th Indiana Infantry, 8th Indiana Infantry and tagged 36th Indiana Infantry, 69th Indiana Infantry, 8th Indiana Infantry, agricultural implements, Alpha Jay, blacksmith, city councilman, Civil War, Edward Shaw, Elizabeth Shaw, Fort Blakely, Gaar Scott, General William Grose, Governor Oliver Morton, Hagerstown Indiana, Henry M. Harris, Israel Harris, L.K. Harris, M.M. Lacey, Mary Kinsey Harris, Nashville Tennessee, Oran Perry, Richmond Indiana, Roswell Harris, Shiloh, South Bend Indiana. Bookmark the permalink. 8 Responses to Who is L.K. Harris? Looks good, man. Who’s your designer? My designer, who made the wonderful header at the top of the page, is my very talented, very beautiful wife. And she’s not only a great designer, she’s a fantastic writer too. Everyone can read her (your) stuff at Mirrored Images. Thanks for sharing your talents and your life with me. What a wonderful story about your great-great grandfather! Thank you so much for sharing it! Your blog is wonderful, I have subscribed via Google Reader and can’t wait to read more of your writing. I’d love to discuss the Boys of the 69th with you. I can be reached at me277@sbcglobal.net. Thanks, Lisa. I look forward to discussing the Boys of the 69th with you. And, for the record, your blog is wonderful too! I am endlessly fascinated in these old time accounts of someone’s life. Thanks for sharing this in the Challenge, Kevin. Thank you for including me in your blog post. I too think these old stories are so interesting! I’ve got your great (x2) grandfather’s signature on the bottom of my civil war ancestor’s discharge papers of 05 JUL 1865! My great (X3) grandfather was James D. Drill of Co.F, 69th IND. I’ve downloaded CPT Harris’ picture from your blog and will keep it with the discharge. –Damon Drill, Kokomo, IN. ..also, CPT Harris had enough foresight or sense of history to write on the back of the discharge paper: “This soldier was engaged in the following battles:” and went on to include the engagements of the 69th from 1862-5.